Unwrap Rice Krispie™ treats and cut off a small piece of one end to make them square. Set aside. Pull Oreos™ apart and scrape off white filling. Discard filling and set aside. Unwrap Hershey's™ Nuggets and set aside. Place the white chocolate chips in a microwave safe bowl. Microwave in 30 second increments until melted. Stir in several drops of red food coloring along with the shortening until smooth. Cool for a few minutes. Using a butter knife, spread the slightly cooled red chocolate on the top and sides of each Rice Krispie™ square. Immediately add 4 mini Oreo™ halves to resemble tires. Place one Hershey's™ Nugget on each top, at one end, to resemble the motor. 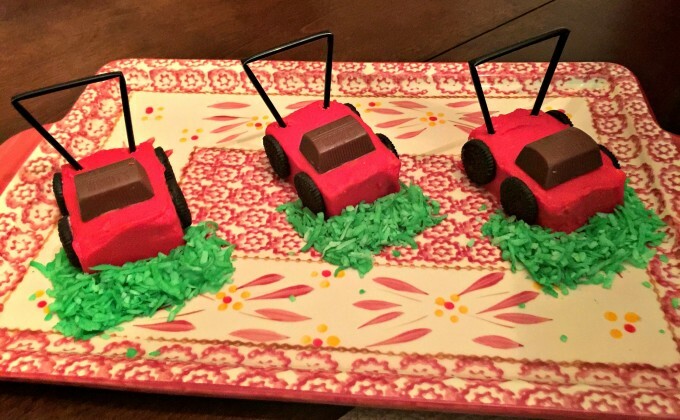 Once chocolate is completely cool, bend the coffee stirrers in a "U" shape and insert into the top of each treat to resemble the lawn mower handle. Set on your temp-tations® 13" x 9" Lid-It® and serve. Optional: For even more fun place 1 - 2 cups of coconut in a small bowl and mix with green food coloring. Place a bed of coconut under lawn mowers to resemble grass.